It's summertime, and our minds turn toward the shore where we find sparkling sands, delicate shells and refreshing breezes. This sets the theme for our latest BY THE SEA challenge. Let's take a virtual beach trip by creating any kind of vintage or shabby chic project that features a nautical or beach theme and color palette. I started with a piece of wood that was an off cut from a house project. 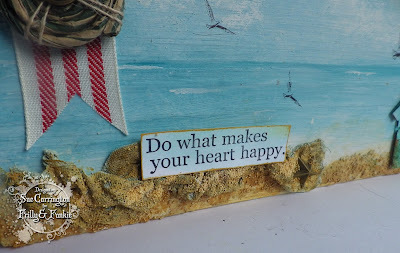 I gave it a coat of Gesso then used Prima Texture Paste White Sand and sprinkled on some small Art Stones. Once this had dried I gave the wood a wash of watered down acrylic paint. 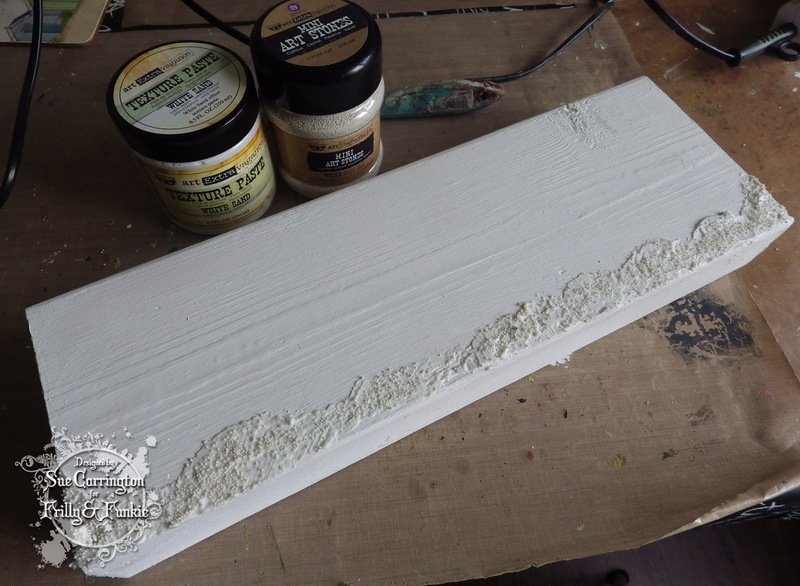 The horizontal grain of the wood gave me the idea of waves so this influenced the way I painted the next layers. I built up layers of blue acrylic paint and dabbed on Tikka acrylic paint onto the texture paste and then spritzed it with water. 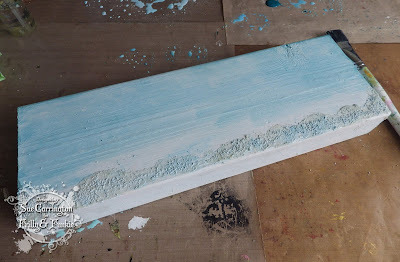 To create some white fluffy clouds I used a baby wipe and made it into a pompom shape and dabbed it in white acrylic paint and pounced it across the top half of the wood. 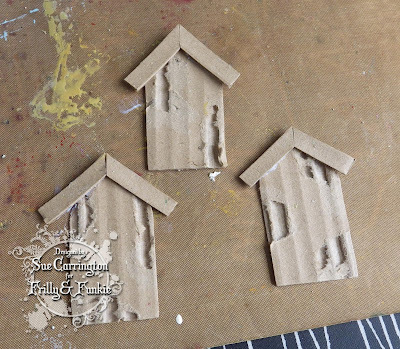 I wanted some little beach huts for my beach scene so cut three arches using the Tim Holtz arches die from some cardboard and added a roof to cover the arch shape. Unfortunately, the batteries in my camera died so I couldn't take any more steps ! 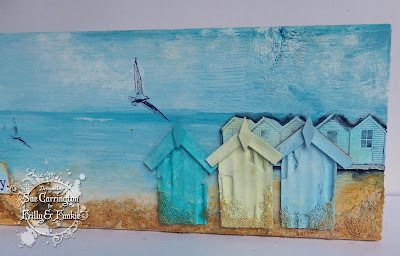 The beach huts were painted with acrylic paint and I used more mini Art Stones and glued them around the bottom edge of the beach huts. For the circle on the stripey ribbon I wound some paper ribbon into a circle and used a needle to add the jute thread and glued a button to the centre. I cut a small piece of gauze and covered it with Prima Sculpture Medium and while it was still wet sprinkled on some mini Art Stones. The fabric goes hard once dry and creates fabulous texture and dimension. 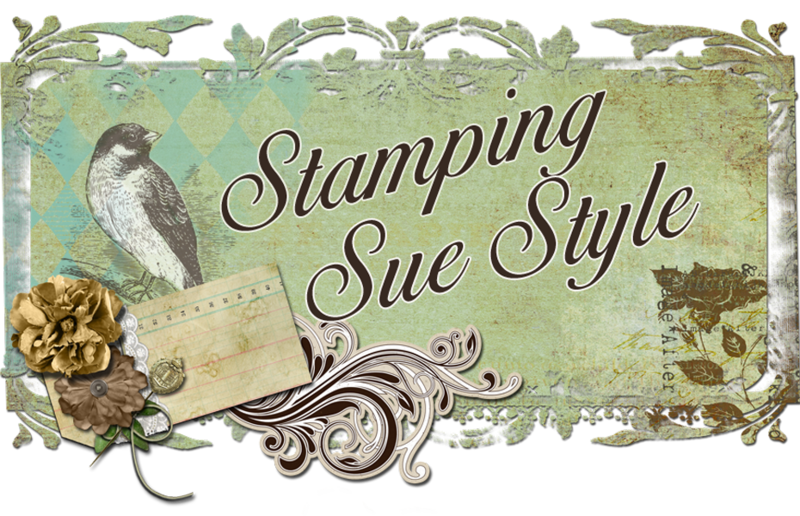 The text is an Yvonne Blair stamp that is stamped onto painted card. The stamped beach huts are stamped onto painted card then cut out. To give them more definition I used a Stabilo pencil and a damp paintbrush. 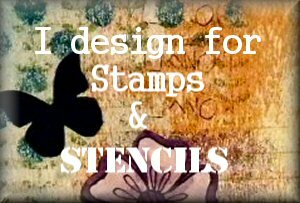 I found some little bird stamps that resembled seagulls and stamped them with black Archival ink directy onto the wood. I hope you get chance to join us for this challenge and share your By the Sea projects with us. Make sure you hop over to Frilly and Funkie blog to see the rest of the DT's fabulous projects. One last thing, apologies for the text on this post for some reason Blogger wouldn't let me take the Italics off or right align it ! 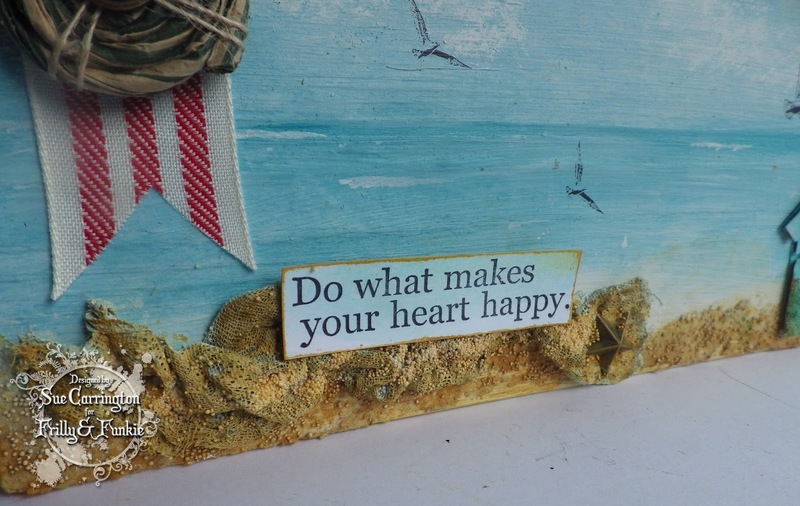 Beautiful visit to the sea with your gorgeous canvas! What a wonderful scene you created with so many clever ideas! Those beach huts are wonderful! Oh be still my heart! This is just fabulously fabulous! The texture yiu created with gauze and medium is so lifelike! I could study this for hours! I had to enlarge each photo so that I could study the delightful details. The wee beach huts are charming. The color palette is perfection! You knocked this one out of the park!